Due to the dramatic developments which unfolded during the last quarter of 2017, the Iraqi Kurds lost their hopes of an independent state of their own, perhaps for generations to come. Turkey’s loss was its most promising sphere of influence in the volatile region of the Middle East, the KRG. The relationship between the two exceptionally close players, Turkey and the KRG, soured to the extent that its reparation in the near future may be more difficult than many could have foreseen. Both are facing uncertain futures and this may further exacerbate the situation of an already turbulent region. Such a situation posits a huge paradox due to Turkey’s adamant stance against the Kurdish bid for independence and the incorrect assumption on the part of the KRG (Kurdistan Regional Government) leadership, particularly President Masoud Barzani, about the modus operandi of its neighbour to the north. Prior to the independence referendum the KRG leadership had anticipated Turkey’s negative position but thought Ankara would not act beyond issuing diplomatic statements, mainly to alleviate domestic political concerns in Turkey itself. This proved to be a huge miscalculation. Turkey, coordinating with Iran and having begun a rapprochement with the central government in Baghdad, effectively paved the road to the Kurdish debacle on 16 October when Kirkuk – with its oilfields and almost all of the “disputed territories” under the control of the KRG – was overrun by forces loyal to the central government in Baghdad and supported by Iran. A senior KRG official in Erbil confided to this writer that Turkey, actually, played a crucial role in this outcome as both the Iraqi government in Baghdad and Iran viewed Turkey as a formidable ally of the KRG – a regional power that would, before, have deterred them from taking drastic steps against Erbil. The KRG counted on certain geopolitical imperatives rooted in recent history. In a region increasingly engulfed by sectarian struggle, Turkey had every reason to see the KRG territory – to the extent that it would be an independent entity outside the control of Baghdad – as a buffer zone against a resurgent Shiite Iran and the Iraqi central government under its conspicuous influence. 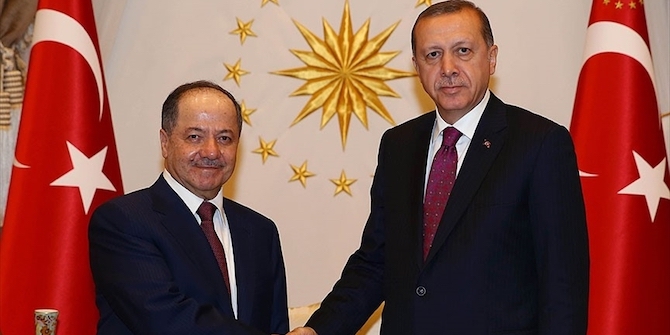 Moreover, the strong relationship with the KRG under Barzani’s leadership was crucial to Erdoğan’s Turkey in its perennial fight against the PKK insurgency. It seemed the war in Syria – where US-supported Kurdish forces associated with the PKK managed to administer almost 30 percent of Syrian territory – had added an extremely important dimension to Turkey’s need to consolidate the relationship with the KRG as an acute rival Kurdish power centre against the PKK and its Syrian associates. Vested economic and financial interests and binding ties that formed the intimate relationship between the Erdoğan and Barzani families also played its part in leading to the miscalculation of the KRG authorities in regard to Turkey’s stance. Turkey, for its part, was unequivocal concerning its stand vis-à-vis the bid for Kurdish independence in Iraq. A closer scrutiny of the new power structure in Turkey, especially in the wake of the botched coup of 15 July 2016 and an awareness of history – revisiting the Treaty of Saadabad signed in 1937 by Turkey, Iran, Iraq and Afghanistan – could explain why Turkey acted as it did in blocking the moves of the KRG leadership toward an independent Kurdish state. The fiery speeches of Tayyip Erdoğan before and after the referendum and the resolutions of the National Security Council meeting of 22 September – five days before its scheduled meeting date – attest to Turkey’s hostile stance regarding Kurdish secession from Iraq. The break-up of Iraq, resulting in a Kurdish nation-state adjacent to Turkey’s Kurdish-inhabited regions, has always been perceived as an existential threat to the Turkish nation-state; a view still prevalent among Turkish policy-makers. Moreover, the neo-nationalist power structure which emerged in Turkey in the aftermath of November 2015 and July 2016 is a coalition of different nationalist components of the Turkish polity, united by an exclusively anti-Kurdish platform. The very nature of the neo-nationalist alliance in Turkey made it impossible for Ankara to countenance the notion of Kurdish independence. Turkey at best could reconcile itself with Kurdish self-rule outside of its borders, if the resulting relationship would be on the basis of a suzerain-vassal format. If the vassal (the KRG) would seek an equal status with that of the suzerain (Turkey), the latter would oppose this on principle. This pattern in Turkey–KRG relations was confirmed during the last quarter of 2017. Notwithstanding the damage inflicted to bilateral relations, geopolitical imperatives and mutual interests will preserve a certain level of relations between Ankara and Erbil. The land border remained open when the relationship was in its worst ebb and the pipelines were never shut off despite Ankara’s threats to the contrary. That said, at the time of writing, high level contacts between Ankara and Erbil had not visibly resumed. Following the referendum the new number one in Erbil, Prime Minister Nechirvan Barzani – known to be a Turcophile – visited Tehran but was not received in Ankara. However, both sides met at international conferences, the most recent meeting taking place at the Munich Security Conference on 16–18 February 2018 between Turkish Foreign Minister Mevlût Çavuşoğlu and Nechirvan Barzani. Both sides are reluctant to resume the relationship. As the Turkish military onslaught against the Kurdish enclave of Afrin in north-western Syria sparked nationalist fervour in Turkey and precipitated pan-Kurdish emotions against Ankara, both sides refrained from trying to restore ties. Given the enormous challenges in a region where enduring instability and constant turmoil seems to be the rule, the Turkish–Iraqi Kurdish relationship is condemned to be based on mutual distrust. For its part, Turkey aggressively intertwined its own Kurdish problem with the Syrian crisis. Worse, it added to it a damaged relationship with the KRG. Turkey, thus, transformed the Kurdish question into an intractable issue on a regional scale. There never has been clarity as to what awaits the Kurds in the region. This situation has now been exacerbated by an enigmatic new Turkey, the dilemma Kurds are facing in Syria and the failed KRG bid for independence.